Procam International, the pioneers of the distance running movement in India, today announced that the registrations for the world’s most prestigious half marathon scheduled for November 19 is now open.With a total prize money of USD 275,000 this year’s edition is expected to witness over 34,000 participants, pound the wide long stretches of the capital on the third Sunday of November. TIMED 10K RUN: Keeping in mind the popularity of the Great Delhi Run and to give a fillip to the emerging runner community, for the first time, there will be a 10K timed run exclusively via charity. This Timed 10K Run is available only for participants above 15 years of age, who want to make a difference by running for charity. The application form for charity running places will be available with the NGOs registered with the Event’s Philanthropy Partner, India Cares. Charity running places will not be available after 13th October 2017 or as soon as running places are filled, whichever is earlier. WOMEN RUNNER CRITERIA in TIMED 10K RUN: For all the women participants, who do not have a timing certificate and are eager to join the running bandwagon, a limited number of seats are also reserved for them via charity. 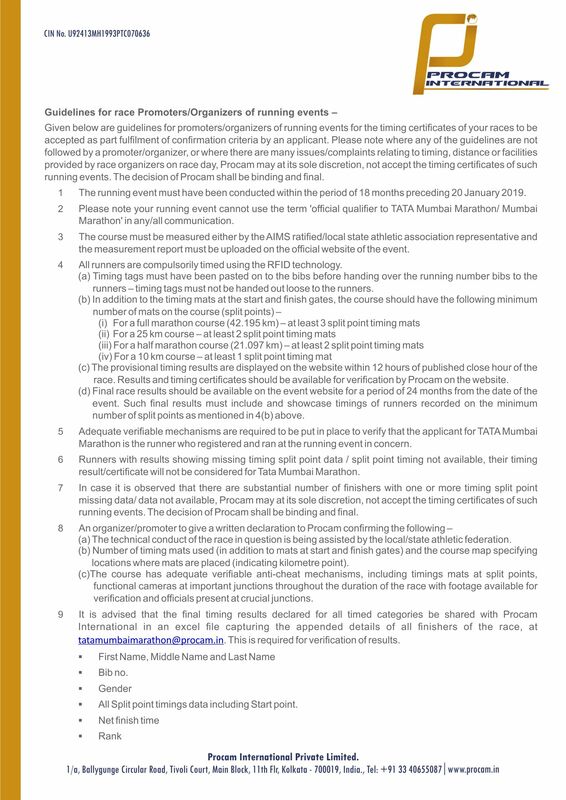 YOUNG RUNNER CRITERIA in TIMED 10K RUN: To encourage young aspiring runners, within the 10K category, there are a limited number of running places reserved for applicants, between 15 years and less than 18 years of age. The Charity Criteria will not be applicable to this section and these running places will be accepted on first come first served basis via online registration on www.adhm.procamrunning.in. NEW SPONSORS: To make any sporting event a grand success, it is imperative to have like-minded sponsors on board and this year two new global brands have extended their association with the event. India’s leading mineral water brand Bisleri has come on board as the hydration partner and Jet Airways, India's premier international airline, as the airline partner. PUMA Shoe Collection Initiative : In its pursuit to encourage running and PUMA's endeavour to give back to the community, PUMA announced a Shoe Collection Initiative in association with Goonj. Under this initiative, starting November, 2017, customers can drop their used shoes at PUMA stores across 12 cities. These can be sports/casual shoes of any brand but should be in a condition such that the recipient can use it. All the collected shoes will be given to Goonj, a social enterprise focused to work on improving accessibility to basic needs like clothing, education and sanitary pads while changing the dynamics of giving & receiving with dignity. Goonj will further channelize these shoes to rural India and eventually help many others set their feet on the ground in comfort. According to various studies and reports, more than half of rural population in India don’t have access to proper shoes. This initiative from PUMA creates a platform to help in this need. PUMA Race Day & Finishers Tee: All the half marathon participants will get the exclusive PUMA Race Day Tee, while first 1000 runners will receive PUMA Finishers Tee. CHAMPIONS with DISABILITY (CWD) & PLANET ABLED: To create a necessary stir for CWD and further engage with the community, this category will be supported by Planet Abled, an NGO that provides accessible travel solutions and leisure excursions for people with different disabilities. With their necessary expertise and manpower, Planet Abled is certain to give the category of participants an enhanced and an unforgettable experience from registrations to race day. ▪ Half Marathon, registrations open on Tuesday, 14th September and will remain open until Tuesday, 3rd October 2017 or when filled, whichever is earlier. ▪ Registrations for The Great Delhi Run, Senior Citizens’ Run and the Champions with Disability Run also open on Tuesday, 14th September and will remain open until Friday. ▪ Timed 10K Run registrations will open on Thursday, 14th September 2017 and close on Friday, 13th October 2017 or when filled, whichever is earlier. The Timed 10K Run will be prioritised in four line up sections on race day as per their timing certificates submitted during registration, namely under 1 hour; 1 hour to under 1 hour 10 minutes; 1 hour 10 minutes to under 1 hour 20 minutes and 1 hour 20 minutes and above. Since its inception in 1988, Procam International has been a driving force behind the growth and development of Indian sports. Envisioned by founders Anil &VivekSingh, Procam is one of the foremost holistic sports management companies, involved in the promotion of national and international sporting events, sports consultancy, and live television programming. Astute planning and exemplary execution of over 75 international events, in various sporting disciplines including cricket, football, tennis, distance running, squash, WWE & horse racing, among others, Procam events have elicited participation from athletes of the highest calibre, as well as huge public interest and attendance. Founder and promoter of some of the most distinguished road races in the world: Tata Mumbai Marathon, Airtel Delhi Half Marathon, Tata Consultancy Services World 10K and the Tata Steel Kolkata 25 K have helped redefine the health & fitness paradigm of our country. In 2017, Procam International launched the Nexa P1 Powerboat, Indian Grand Prix of the Seas, from Mumbai’s very own amphitheatre, Marine Drive. This Powerboat World Championship Series event had, close-to-shore racing, a course on water (for the first time ever), and participation from the world’s best pilots and navigators. An august beginning for another path-breaking sporting paradigm.